Could Your Job Be Putting You At Risk for A Vein Disorder? Many professions require long hours on your feet that can lead to vein disorders like varicose or spider veins. The legs not only hold the majority of body weight but they also constantly circulate blood throughout the legs and into the rest of the body. There are intricate networks of veins that carry blood from the body to the heart. To prevent blood from flowing backward, veins have a series of one-way valves that keep the blood flowing in one direction toward the heart. The most common place for varicose veins to develop is in the legs because blood pools in weakened blood vessels causing the veins to enlarge and stretch. Standing for a long time can increase the risk of developing varicose veins especially if you are more susceptible to vein disorders. Women are more likely to develop the condition because of hormonal changes during pregnancy, premenstruation and menopause. Other factors that can increase your risk of developing varicose veins include your age- causing wear and tear on the valves in your veins, genetics and obesity. 1. Teachers- From the first to the final bell, teachers are constantly on the go, and they spend hours on their feet in front of the classroom. 3. Casino Workers- Dealers, bartenders, cage cashiers, cooks and cocktail waitresses all spend the majority of their time at work standing or walking while providing service to hotel guests and gamblers. 4. Hairdressers- In many cases hairdressers spend 90% of their day standing which can be hard on their feet, back and legs and can increase the risk for varicose veins. 5. Mining/Construction Workers- Individuals who work mining and construction jobs experience long, physically exerting hours, often without ever sitting down. If you work in one of the mentioned industries, be aware of the risks associated and take the necessary precautions to reduce your chance of developing vein disorders. Exercise regularly to improve your leg strength, circulation and vein strength and to maintain a healthy weight. If you have to stand for long periods of time, shift your weight from one leg to another every few minutes. Wear elastic support stockings, but avoid clothing that is too tight, or that will constrict your waist, groin or legs. Also, comfortable supportive shoes will help you keep a natural stance. Finally, make sure you include high-fiber foods in your diet, drink plenty of water and minimize your salt intake. If you are concerned you might be suffering from spider or varicose veins, contact the Reno Vein Clinic at (775) 329-3100 or visit our website at www.renoveinclinic.com. If you are a woman or man and have noticed a large bluish/purplish vein or veins bulging from your legs, don’t feel alone. You are suffering from the un-aesthetic appearance of varicose veins. Varicose veins can affect you at any time in life, but are more common in men as they age and in women during pregnancy as well as aging. People who have varicose veins often feel embarrassed to wear shorts, or clothes that reveal their legs. Many times, they can prevent people from leading full lives because of their often embarrassing nature. However, all is not lost. Getting varicose veins does not mean your life has to stop and shorts are a thing of the past. Maybe before you knew people who got them and then just dealt with them for the rest of their lives. Today, that doesn’t have to be you. Doctors have innovated varicose vein removal technologies so that there are procedures that are outpatient and require very little recover time, while effectively removing the unsightly veins. 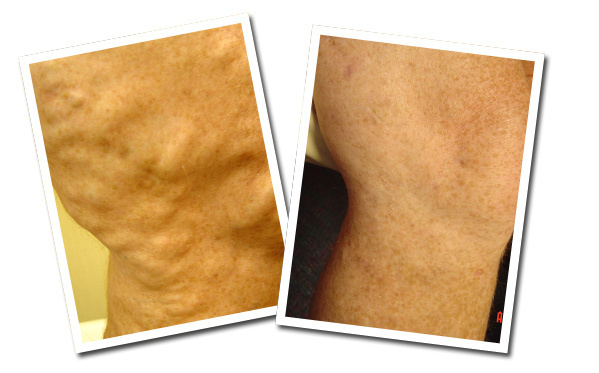 One procedure we perform at the Reno Vein Clinic to do this is the ClosureFast™/Radiofrequency closure procedure. This procedure is FDA approved and has exceptional results. This is a “same-day” surgery, only taking one to one and a half hours, and is performed under what is known as “twilight anesthesia”, which is minimal I.V. sedation and local anesthesia. This procedure differs from others in that it is minimally invasive and patients are able to resume regular activity very fast. ClosureFast ™ is especially great because patients who have had it done reported less pain and a much faster recovery time. The best part about ClossureFast ™is that it is covered by most insurance plans! We urge you consider ClosureFast ™ as an option for the treatment of your varicose veins so that you are on your way towards wearing all the clothes you thought you couldn’t anymore!